Entirely the same drawing as my original Bioshock drawing I just tweaked the colors in photostudio. Anyway I think I might like this version more since it seems to be darker and has more contrast even though I didn't change the contrast at all. Yeah it took me on and off for like 4 weeks, plus I really procrastinated a lot since I started it in like September of last year. Thanks so much for the comment! Haha aww thanks, I don't know about godly though, it just takes some patience and practice that's all. There is no way! That is sooooo awesome! I won't never draw something like that and that is so cool very nice job! I think you could with enough practice, I mean I'm extremely used to the ms paint program since I've been using it for like 9 years so... Anyway thank you for such great feedback! The blood red color goes really well with the creepy feel of this. Thanks, it seemed like the only other colors that fit with this...or made it pop more. Are these games any good??? Saw them on youtube but never watched them. I've actually never played any of them so I wouldn't know, although it is rated as being one of the top 20 PS3 games of last year. Anyway yeah I have tried a jade green color and it did look pretty cool although I didn't want to add like 3 versions of one drawing and bore people. I love me some creepy games^^ Well, this is still awesome and you are still the GOD of ms paint!!! Aww thanks again, but a god I don't know about that. I love the red version looks like the dig daddy is in Kill mode. Thanks, I'm glad you like it! And you just gave me an idea for a better title. 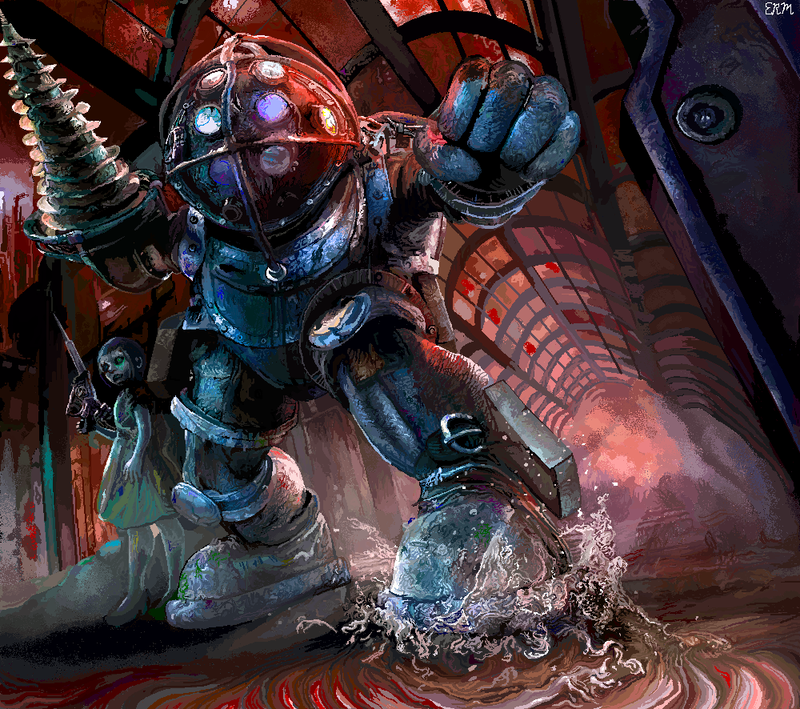 I liked the original version only because the aquatic reflections of the Bioshock world was art in itself. However, in this picture, the water is almost blending with blood, and it looks awesome! ;P EXCELLENTE!